Great loves are said to come only once in a lifetime, but for fans of the ABC Family Channel series CHASING LIFE, there is hope that for April Carver (Italia Ricci) that true love will come along twice in her life. It was always such a tug-of-war for April’s heart as she initially fell for her co-worker Dominic Russo (Richard Brancatisano) and then found herself falling in love with fellow cancer-survivor Leo Hendrie (Michael Scott Foster). But in Season 2, that struggle for April’s heart was finally determined when she married Leo and embarked on her new life with him. But it was to everyone’s horror and dismay when Leo suddenly passed away and that love-story was over almost as soon as it had begun. Yet it also reopened the door to April’s previous love and Dominic was suddenly hopeful that all was perhaps not lost in his quest to win the heart of April once and for all. 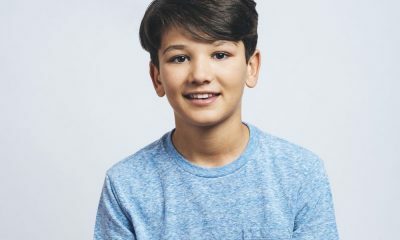 In a recent press conference interview, star Richard Brancatisano talked about the possibility of love reigniting again between April and Dominic, as well as the fun he is having exploring the many different aspects of just who Dominic is in the CHASING LIFE world. 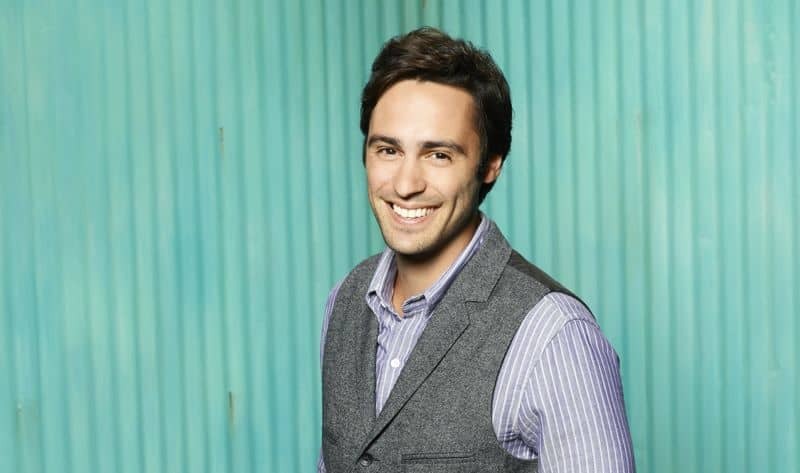 How did your musical talent come about for Dominic in the most recent episode of CHASING LIFE? RICHARD: Well, it came about pretty organically. I think from the start, throughout the first season we all hung out and we get to know each other pretty well, and it had come up in conversation, and we had had a couple of karaoke nights here and there. People knew that that’s what I was doing and I did quite a lot of live gigs and played live music back in Sydney. So, it was something they were always aware of. 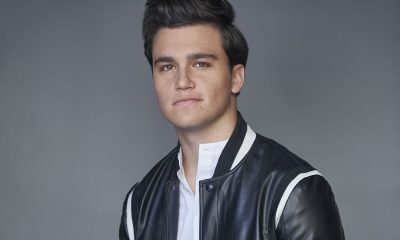 I guess by the second season they just thought it would be a good idea to implement it and include it as part of Dominic’s character, considering he’s a music journalist and there’s always been a guitar or two hanging around the apartment, so it was always something that could fit quite fluently into the story and to his character. Italia had often suggested it because we sometimes play around off set, or pick up the guitar on set, and I think Italia was pushing for it for a bit. One day they just came down and said, “Oh, by the way, you’re singing in three episodes.” And I was thinking, “Oh, cool” and they told me what song I’d be playing and singing. It happened to be a song that I really liked and I think it suited my voice and my range, which is always nice to feel comfortable singing and you can understand the sentiment behind it, and tell the story. So, that was really awesome to have that kind of a song. I also loved the way it was implemented into the actual scene, how Dominic gets up on a whim and just plays, and there’s that moment between him and April. So, I’m really stoked that it became part of the episode. Do you hope Dominic’s music is a storyline that will continue? RICHARD: Absolutely, yes! I would love for it to continue! I think there’s a lot of room for it to grow. I love music, I always have, it’s my first love, and so any time they want to include music in Dominic’s character and get more of him playing and singing, I’m totally up for it. RICHARD: I would honestly probably have to say the party bus episode, it was a lot of fun! Whenever we’re all hanging around together it’s always a good time. Sometimes it can be a little segmented with our storylines all revolving around April, which is great, and I love her, but it’s a special day when we all get to hang out together, and the party bus was one of those days. It was a fun script, and a fun storyline with the banter between Leo (Scott Michael Foster) and Dominic. That was a good time. A couple other scenes I really enjoyed were the fight scene with Leo, hanging out at the bar there and then the guitar and the song in the last episode was really nice. The whole camp, the setup where it was and the whole day there was beautiful, and they lit it so well so it had such a good vibe. It was really something. What was it like filming the fight scene between Dominic and Leo? How much filming you guys get to do in and around Boston? RICHARD: Every maybe 10—13 episodes we head out to Boston for a week. So, in the first season we were in Boston twice, and this last season, Season 2, we were in Boston once. Each of those times was about a week, we go and we stay around the north end, which is a little away from more towards the city, as we did last time. We just eat a whole bunch of good Italian food, and lots of oysters and seafood, and have a blast shooting there, meeting the locals, and working with the local crew. Boston’s such a character in the show, and it really contextualizes where it’s set, and the vibe and the energy. To get to shoot there actually on location is a big deal for us, and we feel very blessed. Can you tell me a little bit about your upcoming project “Alex and Eve” and what drew you to the project? RICHARD: “Alex and Eve” is a feature that I shot in Australia last year. It’s going to be released, October 14th and premieres on October 22nd. It was a great project and was so fun. I was in hiatus on CHASING LIFE and when the script came across and I read it, I found myself laughing out loud as I was reading it. The themes in the script were universal, but also very relevant right now, being about two people that fall in love but they have different traditions, different family beliefs, in particular their religious beliefs. The story’s really about generations moving past and moving forward, and trying to allow love to win, and allow love to be the deciding factor of whether two people should be together, and not traditions, past beliefs, and these ideas that we have about other people that we just don’t know are true. It’s a Romeo and Juliet in a way, but in certain ways more relevant to now being between two different families of different religions. It’s done in a very funny way, which is always a great way to bring up sometimes touchy subjects. That’s what comedians do, and that’s why this script was so good. It was a blast to shoot back in Australia as well. Do you think Dominic’s feelings for April will change the dynamic of their friendship that they’re starting to build up again? RICHARD: Yes, I think it will, because with Leo dying he really had to become a friend again to April. He had to put his feelings on the back burner and put her feelings first, and her loss first. That has really changed how he feels, if he does think there’s a chance with April that’s totally changed the game for him now. He’s playing on a different field with different rules. As we see him and April really getting along now, I don’t think that’s stopping his feelings for April at all; it’s only making him fall in love more with her. However, he’s in this place where there’s guilt, and it’s not fair game anymore. Before he was punching Leo and fighting over the girl, and it was all fair game. But now he’s gone, and I think this is a new experience for him. It’s probably a new experience for a lot of people. It’s interesting watching his struggle and in the next two episodes you see how he deals with it, whether he stays and speaks the truth, or he tries to run or leave because he thinks that’s the best thing for April. Maybe not for himself, but he has to take one for the team because he knows it’s too hard for her to move on at the moment, and it’s too soon, and she can’t make a decision. He doesn’t want to force that, or put April in a crappy position because she’s already going through enough. Do you think there’s been more of a character development within Dom in Season 2 compared to Season 1? RICHARD: I enjoy both character developments. I think in Season 1 we saw Dominic and April really blossom in the first seven episodes, and get along, and were just starting to get into a really tight romantic relationship, when obviously the whole point of Season 1 was how cancer changed her life and how one minute everything was normal, and the next everything changes because of this diagnosis. We saw a very realistic portrayal of her relationship ending and her relationship veering to the worst side. With Leo we saw cancer bringing people together, and with Dominic and April we saw cancer pulling people apart. I think the writers did a really good job of showing a realistic way of how this can impact a relationship. I think Dom grew up a lot in the first season and learned to look at her actions from a different perspective and not take things so personally. The second season is very much about Dom making his own life and deciding whether or not to now come back and chase after the girl that he loves. He’s healed. She’s healed. So what happens now? Is there any character on the show that you’d like to see Dominic have more scenes with that you haven’t got a chance to work with as much as you’d like? RICHARD: That’s a really good question. Uncle George (Steven Weber). Dominic’s never really hung out with Uncle George. Dave is hilarious and we always brush past each other on set and say hello and stuff, but I’ve never really got to work with him, but I love his work. He’s also an absolute scoundrel on set and making everyone laugh and I really like that about him. I’m very much like that on set; having a good time and enjoying myself. I don’t know how, but, I’d love to see more of Dom and Uncle George. Will we see more of Dom and Danny (Abhi Sinha) hanging out? RICHARD: Oh, I hope so. Abhi and I are really tight outside of work. He was literally just over here just before the call started [laughs]. I told him, “You have to leave now because I’ve got to make a phone call,” and he’s like, “Yes, dude, I’ll just sit here.” But I couldn’t concentrate if he was just sitting here. He was literally just over putting down a self tape. We help each other out. We do auditions all the time and just hang out on a regular basis. I think the script writers see that and when there’s an energy and a vibe between two people I think they love to write it in and to utilize that. That’s probably what happened with me and Abhi. We got to bro out a lot in this season, which was heaps of fun, working on set with each other when you’re such good mates. It’s always a good time. With some mixed fan reactions of Dom still in love with April and wanting her back, what’s your opinion? RICHARD: It’s interesting the world of TV, like timelines are skewed a bit and you’ve got to make time go a little bit quicker, so I can understand. In real life, I’ve never been in this situation, but I would imagine it would take a long time to get over the death of your husband. I think a lot of people loved Leo, I loved Leo, and that just makes it even more important that she grieves him properly and doesn’t move on too quick. I also think Dominic really respects that, and he doesn’t want to be the one making a move. He gets it. You’re going to see in these next two episodes, he doesn’t want April to know he still has these feelings for her because he doesn’t want to put her in that situation where she feels weird. These next two episodes really explore this dynamic between them. I think the writers do a really good job of answering that question in the last two episodes, and bringing it to an end that I think the fans will like. If April and Dominic ever get back together, do you think Dominic can overcome Leo’s ghost, or is he always going to be in his shadow? RICHARD: That’s a really good question. That is what’s going to make the drama. If they do get back together I think that is an interesting topic that a lot of people go through with living in someone’s shadow, or competing with an ex, whether they’ve died or whether they’re still around. I think that’s a very universal theme. And I’d love to see it explored in the next season. What’s been your favorite scene to film between Dominic and April? RICHARD: I really liked the episode when April comes back to Dom’s place high on Ecstasy, and she sits there and she’s asking Dominic, “Do you want to feel good, too?” There’s a subtle undertone that if Dominic wanted maybe they could be a little more intimate, and I loved the way it played out and how Dominic made the right decision. He loves her so much and to be with her would mean everything, but he knew the right thing to do. I think that really showed Dominic’s true colors. It was a fun scene to shoot, because I feel like every human being has been in a situation where they want something but to have that thing would be to take advantage of someone else. And they put themselves aside because they care about the other person more. It was fun as an actor to explore that, and to portray it for other people to see it, and to relate to it. Can you describe the next episode in three words? RICHARD: From Dominic’s and April’s point of view, I would say : fear, secrets, and hope. Who’s been your favorite guest star and if you could have any guest star, who would you want it to be? RICHARD: Illeana Douglas playing my mum. She was fantastic, such a pleasure to work with, and she’s done some amazing stuff. To have her play my mum, and working with her was a great experience because she’s so honest and always so connected to whatever she’s saying. Whenever you get to work with actors like that, it makes you want to improve a lot more and bring your A game. I had a great time with her and I learned a lot. Any time I hear that Dom’s mum’s coming back into the picture I’m a very happy man. Could I ask for Ryan Gosling to be on the show, or Jake Gyllenhaal? I’d love Jake Gyllenhaal to come on and play Dominic’s best friend. Are there any pranksters on set and what was their best prank to date? RICHARD: On this set I would say it’s not a huge prankster set. Everyone’s pretty professional. Italia is working so hard all day I don’t think there’s much energy left for pranks on her behalf. She’s in every scene every day, and it’s heavy stuff. So, while we do have a good time and we joke around a lot, there’s nothing huge in terms of pranks, well, that I’ve witnessed. I know Steven Weber likes to joke around a lot, and this isn’t really a prank, but this is something that was a good surprise on our birthday, Italia and I have the same birthday, on the 29th of October. And we were shooting a scene in an elevator, and we were in the elevator and the doors were closed and we thought the scene was about to start, and then we did the scene and then the doors opened for us to exit, and then everyone was around outside with a birthday cake. The crew, the cast, everyone, there were maybe 50 people or more. I’ve never been surprised that much in my life, honestly. Sometimes you expect things and for some reason just nothing. I was not expecting anything and then for that to open up and everyone to do that it was awesome and I was utterly surprised. If you could write an article in a newspaper about anything, what would you want to write about? RICHARD: Wow, that’s good! I would like to write about the human mind and consciousness and how we think and better ways as human beings to think about things, or to not think, and just how, I don’t know, to become a better, nicer, more efficient human being. That’s something I’m really interested in. So, if I was a journalist I’d probably do a lot of research on that kind of stuff and try and write some stuff that I found interesting and hope that other people found it interesting, and could use it practically in their everyday life to make life a little smoother, and more enjoyable, and better for everyone. How long does it usually take to finish one episode from start to finish? RICHARD: There’s a lot more that goes into filming an episode, which doesn’t just include the actors. There’s a lot of pre-production on scripts, a lot of script writing with the team, and then running it past the network, and the producers. With the scripts even once we get a pre-production draft, we read it and then we take it to a table read. We do a table read for the next episode while we’re shooting the episode we’re on. So starting with the AD, who basically runs the ship on set, he’s prepping for that next episode. So, we’ve got two ADs and one AD will be working on the episode we’re working on, and then another director prepping for the next episode. So, even before the actors start acting on set for that episode, there’s been weeks and weeks of pre-production on that script, and a week of pre-production with the team with locations, sorting all that stuff out. Then we get to shooting, and we shoot an episode in six or seven full days and those days we shoot anywhere between four and eight scenes. It depends on how long the scenes are, how many setups are required in the scene, meaning how many different camera angles they want to shoot with, and how complex those setups are. There’s a whole team of people who are putting these jigsaw pieces of this puzzle together to try and get it shot. Obviously, we shoot all over the place in terms of timeline. A lot of people ask this question, and I would have thought the same thing if I didn’t think about it much, but if you had to shoot the episode with the same timeline in terms of the same order of the scenes, it would take a lot longer, driving to each place and setting up. Every scene in that location we shoot on that day, which saves us a lot of time. After that we’ve got post-production, which is when they’ve got to edit and color it, as well as work on the sound. We’ve got to go in and do dialogue replacement if the sound’s off or if something was going on over our line and you couldn’t understand it. It’s a lot to make an episode, but in terms of just shooting it’s about six to seven days for us personally. Do you ever see yourself moving behind the scenes and do you pick people’s brains on set? RICHARD: I actually do. I’m really interested in the other aspects, particularly lighting and shooting, so I guess the DP aspect. I’ve always loved cameras, and I shoot stuff at home. I’ve been shooting a little YouTube web series with my friends at the moment called “Struggling Service.” You can check that out on YouTube. We’ve got three episodes out, and two more to come. Hopefully we’ll make eight. I started by acting in it, because one of my best mates was doing it and he asked me to act in the second episode, and now I’m shooting, editing, and all that. I really, really enjoy it! It’s also nice to have a hobby that you don’t get paid for, because it stays pure in a way. You only do it when you want to do it. You’re not at the whim of someone else’s needs because they’ve paid you. So, that can be very liberating and it means that nothing ever gets tainted because you’re always just choosing projects that you want to do, which is really fun. But on set, the crew is fantastic, and they’re always happy to talk about their forte and what they do. Brandon, the DP, and I get along really great. I even bring my camera sometimes to shoot scenes, and we attach it to their camera rig and shoot just to see the difference that this lighting makes on the set. You can never underestimate how much good lighting changes everything. You’re painting a picture with light. That’s what you’re doing. So, that’s taught me a lot. What do you like to do during your free time when you’re not filming for CHASING LIFE? RICHARD: I like to do several things. One of the main things I like to do is concentrate on my music. Now that I’ve got some time off, apart from auditioning and stuff, which is what most actors do when they’re not working, they try and get another job, so it’s sending in a lot of self tapes and going into the room and auditioning. Apart from that, which is obvious is that I like to play, write and record music. At the moment I’m working on a bunch of songs. I’m looking to put a live show together so I can go out and start playing shows around Hollywood and L.A., which I’m really excited about. I just bought a guitar last week, which I’m stoked about, and have been playing non-stop. I’m also building my rig, as we call it, my equipment here in the States, because I left all my guitars, amplifiers and pedals at home, so I’m in the process of buying a whole bunch of equipment, which is stressful and fun at the same time. I don’t want to make mistakes and buy the wrong stuff, but at the same time it’s really nice to start afresh in another country and just buy the bare necessities, exactly what I want. At home you accumulate so much equipment over the years, 15 years of playing. I’ve got so many pedals, amps, and guitars that I don’t use, but that I haven’t sold, or wanted to sell, and they’re just taking up space and now I’m finally at the point where I’m like, oh, that’s what I want there and that’s what I want there. So that’s literally what I’m doing right now. But in my general year, a lot of music, hanging out with friends, I like to play tennis with Abhi, and I love seeing live music and watching bands. That’s something I really enjoy. I get to do that a lot more here in Hollywood than I do back in Australia because in Australia I would be playing most nights, which is a lot of fun, but it stops you from going out and watching bands. If you can take a gig, you’re going to take a gig. But to get here and to have a day job and then at nighttime actually go and support bands and support friends, and find new bands has really been a lot of fun and motivating to get my own music going here. Do you have a favorite TV show you’re currently watching, or looking forward to watching when it premieres in the fall? RICHARD: Yes. I watched the last season of EASTBOUND & DOWN again. I finished it last year, but then I re-watched it again and Season 4 of that show is just amazingly well done. To me it’s fantastic. I’m halfway through WET HOT SUMMER. I watched Bob Durst THE JINX recently, and that took it to another level. That was something I really enjoyed. How do you think the fans now feel about Dominic now, especially the ones that were rooting for April and Leo? RICHARD: Well, it’s tough to know because on one hand I say my fans have always been rooting for Dom and are constantly very supportive like that. But I also see a lot of fans on Facebook or whatever loving Leo, and I think it was really hard for them to lose Leo. I think Dominic is slowly winning people back. I don’t think it’s also about winning. I know there has been a bit of competition there, Team Dominic and Team Leo, but they’re two very different guys, and I think they represent two different types of people in this world, and two different types of relationships you had, and two different circumstances that can arise if you’re in a position like April was in. Dominic and April was the relationship that didn’t work, that cancer broke. But at the same time that’s not to say that it can’t be fixed, or it can’t be resolved, and things can’t happen between them again. I think the writers are slowly bringing it around and showing that. I don’t think it’s so much that they’ve got an agenda like they want Dominic back with April. I think it’s more about exploring relationships and how cancer affects those relationships, how honesty affects those relationships, and everything else. To find out if romance will be able to blossom once again between Dom and April, or they will just continue to be good friends in each other’s lives, be sure to tune in for the final two episodes of Season 2 on Monday, September 21st and 28th on ABC Family Channel.